India celebrated its 60th Republic Day with fanfare Monday, with national leaders mourning security personnel killed by terrorists and thousands attending official functions in the troubled regions after defying boycott calls from militant groups. Elaborate functions and parades involving school students as well as military, paramilitary and police personnel took place in all the states and union territories. Tight security was visible everywhere including in the national capital which hosts the most elaborate event to mark six decades of India embracing a Republican constitution. In Jammu and Kashmir and the northeast, thousands defied boycott calls from separatists. Although the number attending the function at Srinagar's Bakshi Stadium was put at only 300-400, officials pointed out it was the highest participation in two decades of militancy. In New Delhi, President Pratibha Patil, India's first woman president, took the salute at Rajpath in the heart of the city. Kazakhstan President Nursultan Nazarbayev, the chief guest, watched the 150-minute spectacle with keen interest. 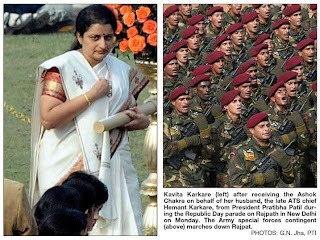 Patil gave away posthumous Ashok Chakra awards, the country's highest gallantry award in peacetime, to 10 widows and a mother of soldiers and policemen who died fighting terrorists in Mumbai, New Delhi and Jammu and Kashmir. 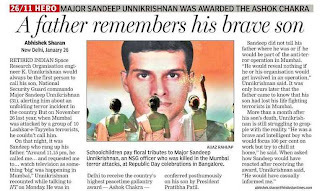 A sombre Patil patted each of them on their shoulders and shared comforting words with them. Security forces, on the edge in the wake of last year's terror strikes in the country, heaved a sigh of relief at the end of the day. Addressing the official function at Mumbai's Shivaji Park, Governor S.C. Jamir paid tributes to the victims of the 26/11 Mumbai terror attacks that killed some 170 people including 26 foreigners. India says the terrorists were Pakistanis. Jamir honored 111 policemen with medals for bravery. Jammu and Kashmir Rural Development Minister Ali Mohammed Sagar urged Prime Minister Manmohan Singh, who watched the Republic Day parade on television from his hospital bed here, to resume the peace process with Pakistan, stalled in the wake of the Mumbai carnage. "We appeal to the prime minister to restart the peace process between the two countries so that distances between them are narrowed down," Sagar said in Srinagar. In Jammu, Governor N.N. Vohra called upon militants "to recognize the futility" of their separatist campaign. People in the northeastern states of Assam, Tripura and Manipur defied a 17-hour general shutdown called by separatists to boycott the Republic Day celebrations. In Raipur, Chhattisgarh Governor E.S.L. Narasimhan praised the commitment of the security forces battling Maoists. Narasimhan's speech was followed by an impressive cultural show by school children. 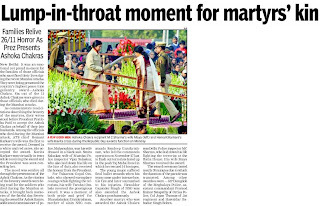 In Punjab and Haryana and their common capital Chandigarh, the Republic Day was celebrated with enthusiasm. Punjab's new Deputy Chief Minister Sukhbir Singh Badal unfurled the national flag in Patiala. His father and Chief Minister Parkash Singh Badal did so in Amritsar. In Orissa, Governor Murlidhar Chandrakant Bhandare took the salute as thousands defied Maoist calls to boycott the celebrations, particularly in southern and western districts. Tamil Nadu Governor Surjit Singh Barnala unfurled the Indian flag on the Marina Beach in Chennai. Chief Minister M. Karunanidhi was absent from the function after being hospitalized due to back pain. Braving the January chill, thousands of Bangaloreans thronged Field Marshal Manekshaw parade ground to see hundreds of children and youngsters presenting colorful programmes. Kerala Governor R.S. Gavai stressed the need to improve the quality of higher education in the state. Republic Day celebrations in Bihar drew large crowds. In Himachal Pradesh, Governor Prabha Rao commended the development initiatives undertaken by the state after paying floral tributes to the war heroes. Jharkhand Governor Syed Sibte Razi expressed unhappiness over the state's poor development during the last eight years since it was carved out of Bihar, blaming political instability for it. The Jammu and Kashmir government Monday urged Prime Minister Manmohan Singh to restart the fractured peace process with Pakistan even as Governor N.N. Vohra asked militants "to recognize the futility" of their violent separatist campaign. Rural Development Minister Ali Mohammed Sagar in his Republic Day speech in the summer capital Srinagar made a passionate appeal to the prime minister to resume the peace negotiations with Islamabad, snapped in the wake of the Nov 26 Mumbai terror attacks that India blamed on elements from Pakistan. "The process of peace and reconciliation between India and Pakistan has a direct bearing on the lives of the people in Jammu and Kashmir," Sagar said after he unfurled the national flag and took salute at the parade in Bakhshi Stadium. "We appeal to the prime minister to restart the peace process between the two countries so that distances between them are narrowed down." Governor Vohra unfurled the tricolor and took salute at an impressive Republic Day parade at the heavily guarded Maulana Azad Stadium in the state's winter capital Jammu. The governor said: "In our liberal democratic framework there is enough space for divergent thought and opinion. Dialogue is the best way for searching solutions." He also urged the separatists to have "faith in the democratic resolution of their grievances (and) recognize the futility and the tragically high cost of pursuing the path of conflict and violence". School children and contingents of the Jammu and Kashmir police, army, paramilitary Border Security Force and Central Reserve Police Force (CRPF) paraded before the podium as an army chopper showered rose petals. 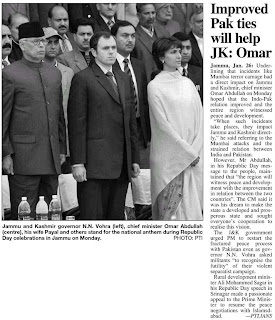 Chief Minister Omar Abdullah, his ministerial colleagues, judges of the high court, senior civil and army officials, including the families of many of them, participated in the Republic Day celebrations at the Maulana Azad Stadium in Jammu. Authorities said around 7,000 civilians had turned out to witness the parade, running the heavy security gauntlet. In the Kashmir Valley, the main parade was held at the heavily guarded Bakshi Stadium in Srinagar, where Sagar said the December assembly elections in the state had been appreciated by everybody in the world and even the militants had started talking in terms of negotiated resolution of their problems. "This is a big change as everybody is fed up with violence." At the Srinagar stadium, school children and contingents of the police and paramilitary forces marched braving the winter chill. Students dressed in their colorful best presented cultural programmes. National Conference president and former chief minister Farooq Abdullah was among the dignitaries present at the function. He joined the dancers for a while. The event was held under tight security, with equipment meant to jam electronic devices installed in a bid to prevent remote controlled explosions. Officials said the gathering at the Bakhshi Stadium was unprecedented. 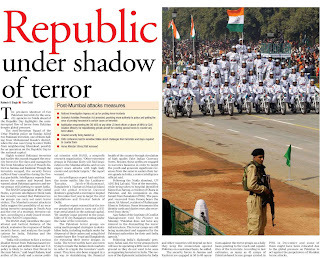 Ever since militancy erupted in 1990, people began staying away from Republic Day and Independence Day functions. The two factions of the separatist Hurriyat Conference led by Mirwaiz Umar Farooq and Syed Ali Geelani had called for protest shutdown Monday. Republic Day functions in other towns of the state also took place peacefully. The war on terror has provoked a clash of civilizations, agreed a majority of the 600-odd people taking part in the closing debate of the five-day Jaipur Literature Festival on the sprawling lawns of the Diggy Palace here. The debate on the motion "The War on Terror Has Provoked a Clash of Civilizations" was anchored by television presenter and journalist Barkha Dutt Sunday night. The panelists included journalist-commentator M.J. Akbar, political analyst Swapan Dasgupta, Pakistan-based author Mohammed Hanif, commentator Ashish Nandy, historian-writer Simon Schama, journalist and political activist Tarun Vijay, Paris-based political commentator and India expert Christophe Jaffrelot and author Rajiv Chandrasekaran. M.J. Akbar, while disagreeing with the motion, struck a patriotic note in keeping with the spirit of the Republic Day Monday. "I will defend the human rights enshrined in the constitution till death, but those rights apply only to those citizens of the country who swear by the constitution and not to terrorists," the columnist-political commentator and editor said, denouncing terrorism and its perpetrators. "But Islam is singular and Muslims are multiple. People have different dynamic intent and the war on terror, which was coined by former US president George W. Bush, is a clash against civilization. One must remember that Islam, as a religion, is 1,400 years old, whereas Fascism, which came to the world with Mussolini, is only 90 years old. Why do you blame Islam for the sins of the Muslims?" he argued. Emotions scaled a high when Tarun Vijay, former editor of the Rashtriya Swayamsevak Sangh mouthpiece Panchajanya and director of the Dr Shyama Prasad Mookerjee Research Foundation, switched to a rigid pro-Hindu mode to agree with the motion, saying the war on terror had opened up a clash of civilizations. "I am and will remain a Hindu. A Hindu civilization versus the barbarism of the Wahhabis is not a clash, but a defence of the civilization by one country against fundamentalism. It is an internal clash of the other kind. The war on terror has provoked an introspection in the Hindu society on why we are being killed," he said. Noted historian and writer Simon Schama, the author of the book "The American Future: A History", felt that the war on terror was a colluded war of convenience and "an empty sententious platitude" coined by Bush. The society attracts high-profile speakers to debates and discourses on current geopolitical and global issues, which are usually broadcast on the British Broadcasting Corporation (BBC). The motion on "War on Terror..." in Jaipur was filmed for NDTV. The concept of the 'Clash of Civilizations' was propounded by American political scientist Samuel J. Hungtinton, whose work "Clash of Civilizations", a thesis of the post-cold war geopolitical order, changed the way the world looked upon terror. He died Dec 24, 2008. ISLAMABAD: Prime Minister Syed Yousuf Raza Gilani has assured the nation that Pakistan’s defense is in safe hands and the enemy would have to think thousands time before imposing any aggression against the motherland. Talking to Chairman Joint Chief of Staff Committee General Tariq Majeed here in the Prime Minister House on Monday, the Prime Minister said that the government is providing all out resources to Pakistan Army to enhance its professional capabilities and there is no need of worry regarding defense of the country. The important meeting between the Prime Minister and Chairman Joint Chief of Staff Committee discussed ambit of issues including country’s defence, on-going operation in tribal areas specially in connection with situation in Swat. Reiterating Pakistan’s desire to have cordial and friendly relations with all its neighboring countries, the Prime Minister urged the solution of all matters through negotiations, adding Pakistan also want good relations with India but the Indian leadership should also move forward with an open mind for the sake of peace in the region. Talking on destruction of schools in Swat by militants, Yousuf Raza Gilani said that such incidents are not only impacting badly on the country but also tarnishing the image of Islam but the incumbent democratic government would not allow such elements to succeed in their nefarious designs. The Prime Minister said that militants neither have any religion nor have any country and their only objective is to disturb the peace of the world, thats why, Pakistan is playing role as frontline state in war on terror. Pakistan faced loss of live and property in war on terror, he added. According to sources, General Tariq Majeed on the occasion apprised the Prime Minister about steps taken by Pakistan Army to eliminate the scourge of terrorism and to enhance country’s defense. NEW DELHI: The country’s military muscle and weapons system were on display here at the Republic Day parade, with a range of missiles, including two variants of the Indo-Russian joint venture supersonic missile, BrahMos, long-range ballistic missile Agni and Advanced Air Defence (AAD) missile taking part. The high-precision missile, with a range of 290 km capable of flying at a speed of 2.8 Mach, rolled down the parade route on two occasions. The missile can be launched from multiple platforms and it was on display as a mobile autonomous launcher and on the tableau of an Indian naval ship’s universal vertical launcher module. Agni-III, a two-stage, solid propellant, long-range ballistic missile, has a range of 3,000 km with a payload capacity of 1.5 tonnes. The indigenously devised accurate missile was successfully flight tested during April last year, adding strength to the country’s strategic capability. The AAD missile, developed indigenously by the Defence Research Development Organisation (DRDO), is the first endo atmospheric interceptor for ballistic missile defence. The missile reaches a hypersonic velocity of 5 Mach with the solid propellant rocket motor. It intercepts ballistic missiles at altitudes up to 18 km with very high manoeuvrability. The AAD is fitted with advanced devices such as seeker, data links, electromechanical actuation systems and siloconised carbon jet vanes. It is transported and launched from a mobile launcher. Also on display was the surface-to-air Akash missile system. Developed by the DRDO, it can neutralise aerial threat penetration from low, medium and high altitudes. The Indian Air Force is in the process of acquiring the highly automated missile system. Also on show were the Army’s Bheeshma T90S tanks that are equipped with a 125 mm smooth bore main gun, 12.7 mm anti-aircraft gun and 7.62 mm machine gun. January 26, 2009: India is buying another 300 Israeli Barak missiles, at a cost of about $1.6 million each, for the Barak anti-aircraft missile/aircraft systems it has already bought. The Barak missiles weigh 216 pounds each (with a 48 pound warhead) and have a range of ten kilometers. The missiles are mounted in an eight cell container (which requires little maintenance) and are launched straight up. The radar system provides 360 degree coverage and the missiles can take down an incoming missile as close as 500 meters away from the ship. Each Barak system (missile container, radar, computers and installation) costs about $24 million. Israel weapons have a solid reputation for reliability and effectiveness. Israeli success in several wars adds to the appeal of their armaments. U.S. and Israeli arms manufacturers often work together, which also gives Israel an edge when selling their equipment. The Barak II was originally bought because of delays in producing the similar Indian Akash system, which has been in development since the 1980s. Akash was recently declared ready for service, and actually purchased by the Indian Air Force. 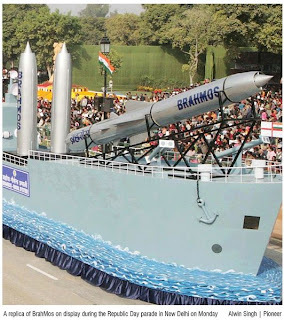 The Barak system was also purchased to do what the Indian made Trishul was designed to do. Barak works, but Trishul is made-in-India, and that counts for a lot. Trishul has been in development for over twenty years. First test firing took place in 1991, and the manufacturer declared test firings completed by 1998. The armed forces, however, rejected the missile, as not ready for service. So development continued, until 2003, when the project was cancelled. But the project, which has cost nearly $200 million so far, had political friends. Development was allowed to continue, even though neither the army or the navy wants it. The missile has a range of some nine kilometers, and has suffered mainly from reliability problems, particularly with its guidance system. NEW DELHI: With tensions with Pakistan yet to abate and the indigenous "Nag'' missile still not operational, the Army has gone in for an "urgent order'' of 4,100 French-origin Milan-2T anti-tank guided missiles (ATGMs). Defence ministry sources said the Rs 592-crore order for 4,100 Milan-2T missiles, pending for quite some time, was cleared after 26/11, with the government finally fast-tracking several military procurement plans. Though tanks are slowly losing their relevance in the modern-day battlefield, and chances of face-to-face armoured confrontations diminishing, they will continue to play a critical role in the India-Pakistan context. Both India and Pakistan, who share a long land border, are currently reorganising their mechanised forces to achieve strategic mobility and high-volume firepower for rapid thrusts into enemy territory. India, of course, has plans to progressively induct as many as 1,657 Russian-origin T-90S main-battle tanks (MBTs), apart from the ongoing upgradation of its T-72 fleet. But with Pakistan now looking to procure T-84 MBTs from Ukraine to bolster its already strong fleet of T-80UD, Al-Khalid and other tanks, India also wants its infantry battalions to have potent anti-armour capabilities. 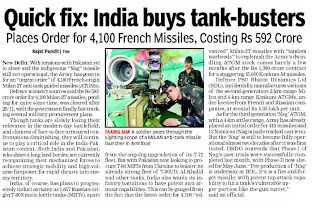 This can be gauged from the fact that the latest order for 4,100 "advanced'' Milan-2T missiles with "tandem warheads'' to replenish the Army's dwindling ATGM stock comes barely a few months after the Rs 1,380-crore contract for a staggering 15,000 Konkurs-M missiles. Defence PSU Bharat Dynamics Ltd (BDL), incidentally, manufactures variants of the second-generation 2-km-range Milan and 4-km-range Konkurs ATGMs, under licence from French and Russian companies, at around Rs 4.50 lakh per unit. As for the third-generation Nag ATGM, with a 4-km strike range, Army has already placed an initial order for 443 missiles and 13 Namicas (Nag missile tracked carriers). But the Nag is still to become fully operational almost two decades after it was first tested. DRDO contends that Phase-I of Nag's user-trials were successfully completed last month, with Phase-II now slated for May-June. "Pre-production of Nag is underway at BDL. It's is a fire-and-forget missile, with potent top-attack capability to hit a tank's vulnerable upper portion like the gun turret,'' said an official. Moreover, Nag's range will be extended to over 7-km in its airborne version named "Helina'', to be fitted on "Dhruv'' Advanced Light Helicopters, each configured to carry eight missiles in two launchers. Incidentally, Nag is the only "core missile system'' of India's original Integrated Guided Missile Development Programme (IGMDP), launched way back in 1983, whose development work is yet to be completed. The IGMDP was "closed'' in December 2007 after DRDO declared development work on all other missiles ― Agni, Prithvi, Akash and Trishul ― was over. While work on "strategic'' nuclear-capable missiles like Agni-III (3,500-km range) and Agni-V (over 5,000-km) is being "undertaken in-house'', India is now increasingly look at foreign collaboration in other armament projects to cut delays. NEW DELHI: For the first time, the armed forces have asked their personnel to exercise their fundamental right to vote in the areas of their posting during the general elections slated for March-April. "The main reason behind this proactive participation of the armed forces in the electoral process seems to be the armed forces being shortchanged in the Pay Commission and their lack of a say in the decision making process," said a high-ranking army official, wishing not to be identified. Though there is a postal ballot and proxy voting system, most personnel are not aware of it. Indian Air Force chief Air Chief Marshal Fali H. Major confessed to IANS in a candid interview: "Though there is the proxy voting system and the postal ballot system, things have not materialised as desired." The IAF chief has himself not been able to vote for the last 10 years because, like most people in the armed forces, he has not been home during election time. "The last I voted was 10 years ago when I was home on vacation. I have voted only four times (in his 41 years of service)," Major told IANS. The IAF chief's statement underscores how successive governments have failed to give effective voting rights to the armed forces. The postal ballot system has proved inadequate due to the long delays involved in sending out voting sheets. In September 2003, parliament had approved the proxy voting system for armed forces personnel whereby they could authorise a family member - usually a parent or a sibling or a spouse - to cast their vote by proxy. This system draws heavily from that prevailing in Britain but has proved to be ineffective because soldiers do not even know the provision exists. Washington's attention is now zeroing in on Afghanistan. There is talk of doubling U.S. forces there, and preparations are being made for another supply line into Afghanistan -- this one running through the former Soviet Union -- as an alternative or a supplement to the current Pakistani route. To free up more resources for Afghanistan, the U.S. withdrawal from Iraq probably will be accelerated. And there is discussion about whether the Karzai government serves the purposes of the war in Afghanistan. In short, U.S. President Barack Obama's campaign promise to focus on Afghanistan seems to be taking shape. We have discussed many aspects of the Afghan war in the past; it is now time to focus on the central issue. What are the strategic goals of the United States in Afghanistan? What resources will be devoted to this mission? What are the intentions and capabilities of the Taliban and others fighting the United States and its NATO allies? Most important, what is the relationship between the war against the Taliban and the war against al Qaeda? If the United States encounters difficulties in the war against the Taliban, will it still be able to contain not only al Qaeda but other terrorist groups? Does the United States need to succeed against the Taliban to be successful against transnational Islamist terrorists? And assuming that U.S. forces are built up in Afghanistan and that the supply problem through Pakistan is solved, are the defeat of Taliban and the disruption of al Qaeda likely? The overarching goal of the United States since Sept. 11, 2001, has been to prevent further attacks by al Qaeda in the United States. Washington has used two means toward this end. One was defensive, aimed at increasing the difficulty of al Qaeda operatives to penetrate and operate within the United States. The second was to attack and destroy al Qaeda prime, the group around Osama bin Laden that organized and executed 9/11 and other attacks in Europe. It is this group -- not other groups that call themselves al Qaeda but only are able to operate in the countries where they were formed -- that was the target of the United States, because this was the group that had demonstrated the ability to launch intercontinental strikes. Al Qaeda prime had its main headquarters in Afghanistan. It was not an Afghan group, but one drawn from multiple Islamic countries. It was in alliance with an Afghan group, the Taliban. The Taliban had won a civil war in Afghanistan, creating a coalition of support among tribes that had given the group control, direct or indirect, over most of the country. It is important to remember that al Qaeda was separate from the Taliban; the former was a multinational force, while the Taliban were an internal Afghan political power. The United States has two strategic goals in Afghanistan. The first is to destroy the remnants of al Qaeda prime -- the central command of al Qaeda -- in Afghanistan. The second is to use Afghanistan as a base for destroying al Qaeda in Pakistan and to prevent the return of al Qaeda to Afghanistan. To achieve these goals, Washington has sought to make Afghanistan inhospitable to al Qaeda. The United States forced the Taliban from Afghanistan's main cities and into the countryside, and established a new, anti-Taliban government in Kabul under President Hamid Karzai. Washington intended to deny al Qaeda bases in Afghanistan by unseating the Taliban government, creating a new pro-American government and then using Afghanistan as a base against al Qaeda in Pakistan. At this point, we must separate the fates of al Qaeda and the Taliban. During the Taliban retreat, al Qaeda had to retreat as well. Since the United States lacked sufficient force to destroy al Qaeda at Tora Bora, al Qaeda was able to retreat into northwestern Pakistan. There, it enjoys the advantages of terrain, superior tactical intelligence and support networks. Even so, in nearly eight years of war, U.S. intelligence and special operations forces have maintained pressure on al Qaeda in Pakistan. The United States has imposed attrition on al Qaeda, disrupting its command, control and communications and isolating it. In the process, the United States used one of al Qaeda's operational principles against it. To avoid penetration by hostile intelligence services, al Qaeda has not recruited new cadres for its primary unit. This makes it very difficult to develop intelligence on al Qaeda, but it also makes it impossible for al Qaeda to replace its losses. Thus, in a long war of attrition, every loss imposed on al Qaeda has been irreplaceable, and over time, al Qaeda prime declined dramatically in effectiveness -- meaning it has been years since it has carried out an effective operation. The situation was very different with the Taliban. The Taliban, it is essential to recall, won the Afghan civil war that followed the Soviet withdrawal despite Russian and Iranian support for its opponents. That means the Taliban have a great deal of support and a strong infrastructure, and, above all, they are resilient. After the group withdrew from Afghanistan's cities and lost formal power post-9/11, it still retained a great deal of informal influence -- if not control -- over large regions of Afghanistan and in areas across the border in Pakistan. Over the years since the U.S. invasion, the Taliban have regrouped, rearmed and increased their operations in Afghanistan. And the conflict with the Taliban has now become a conventional guerrilla war. The Taliban have forged relationships among many Afghan (and Pakistani) tribes. These tribes have been alienated by Karzai and the Americans, and far more important, they do not perceive the Americans and Karzai as potential winners in the Afghan conflict. They recall the Russian and British defeats. The tribes have long memories, and they know that foreigners don't stay very long. Betting on the United States and Karzai -- when the United States has sent only 30,000 troops to Afghanistan, and is struggling with the idea of sending another 30,000 troops -- does not strike them as prudent. The United States is behaving like a power not planning to win; and, in any event, they would not be much impressed if the Americans were planning to win. There is no conceivable force the United States can deploy to pacify Afghanistan. A possible alternative is moving into Pakistan to cut the supply lines and destroy the Taliban's base camps. The problem is that if the Americans lack the troops to successfully operate in Afghanistan, it is even less likely they have the troops to operate in both Afghanistan and Pakistan. The United States could use the Korean War example, taking responsibility for cutting the Taliban off from supplies and reinforcements from Pakistan, but that assumes that the Afghan government has an effective force motivated to engage and defeat the Taliban. The Afghan government doesn't. The obvious American solution -- or at least the best available solution -- is to retreat to strategic Afghan points and cities and protect the Karzai regime. The problem here is that in Afghanistan, holding the cities doesn't give the key to the country; rather, holding the countryside gives the key to the cities. Moreover, a purely defensive posture opens the United States up to the Dien Bien Phu/Khe Sanh counterstrategy, in which guerrillas shift to positional warfare, isolate a base and try to overrun in it. A purely defensive posture could create a stalemate, but nothing more. That stalemate could create the foundations for political negotiations, but if there is no threat to the enemy, the enemy has little reason to negotiate. Therefore, there must be strikes against Taliban concentrations. The problem is that the Taliban know that concentration is suicide, and so they work to deny the Americans valuable targets. The United States can exhaust itself attacking minor targets based on poor intelligence. It won't get anywhere. From the beginning, the Karzai government has failed to take control of the countryside. Therefore, al Qaeda has had the option to redeploy into Afghanistan if it chose. It didn't because it is risk-averse. That may seem like a strange thing to say about a group that flies planes into buildings, but what it means is that the group's members are relatively few, so al Qaeda cannot risk operational failures. It thus keeps its powder dry and stays in hiding. This then frames the U.S. strategic question. The United States has no intrinsic interest in the nature of the Afghan government. The United States is interested in making certain the Taliban do not provide sanctuary to al Qaeda prime. But it is not clear that al Qaeda prime is operational anymore. Some members remain, putting out videos now and then and trying to appear fearsome, but it would seem that U.S. operations have crippled al Qaeda. So if the primary reason for fighting the Taliban is to keep al Qaeda prime from having a base of operations in Afghanistan, that reason might be moot now as al Qaeda appears to be wrecked. 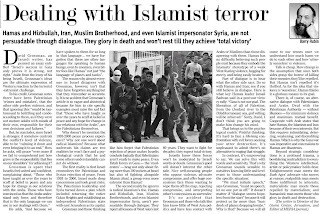 This is not to say that another Islamist terrorist group could not arise and develop the sophisticated methods and training of al Qaeda prime. But such a group could deploy many places, and in any case, obtaining the needed skills in moving money, holding covert meetings and the like is much harder than it looks -- and with many intelligence services, including those in the Islamic world, on the lookout for this, recruitment would be hard. Two things emerge from this. First, the search for al Qaeda and other Islamist groups is an intelligence matter best left to the covert capabilities of U.S. intelligence and Special Operations Command. Defeating al Qaeda does not require tens of thousands of troops -- it requires excellent intelligence and a special operations capability. That is true whether al Qaeda is in Pakistan or Afghanistan. Intelligence, covert forces and airstrikes are what is needed in this fight, and of the three, intelligence is the key. Second, the current strategy in Afghanistan cannot secure Afghanistan, nor does it materially contribute to shutting down al Qaeda. Trying to hold some cities and strategic points with the number of troops currently under consideration is not an effective strategy to this end; the United States is already ceding large areas of Afghanistan to the Taliban that could serve as sanctuary for al Qaeda. Protecting the Karzai government and key cities is therefore not significantly contributing to the al Qaeda-suppression strategy. In sum, the United States does not control enough of Afghanistan to deny al Qaeda sanctuary, can't control the border with Pakistan and lacks effective intelligence and troops for defeating the Taliban. Logic argues, therefore, for the creation of a political process for the withdrawal of U.S. forces from Afghanistan coupled with a recommitment to intelligence operations against al Qaeda. Ultimately, the United States must protect itself from radical Islamists, but cannot create a united, pro-American Afghanistan. That would not happen even if the United States sent 500,000 troops there, which it doesn't have anyway. The U.S. strategy now appears to involve trying a surge, or sending in more troops and negotiating with the Taliban, mirroring the strategy used in Iraq. But the problem with that strategy is that the Taliban don't seem inclined to make concessions to the United States. The Taliban don't think the United States can win, and they know the United States won't stay. The Petraeus strategy is to inflict enough pain on the Taliban to cause them to rethink their position, which worked in Iraq. But it did not work in Vietnam. So long as the Taliban have resources flowing and can survive American attacks, they will calculate that they can outlast the Americans. This has been Afghan strategy for centuries, and it worked against the British and Russians. If it works against the Americans, too, splitting the al Qaeda strategy from the Taliban strategy will be the inevitable outcome for the United States. In that case, the CIA will become the critical war fighter in the theater, while conventional forces will be withdrawn. It follows that Obama will need to think carefully about his approach to intelligence. This is not an argument that al Qaeda is no longer a threat, although the threat appears diminished. Nor is it an argument that dealing with terrorism in Afghanistan and Pakistan is not a priority. Instead, it is an argument that the defeat of the Taliban under rationally anticipated circumstances is unlikely and that a negotiated settlement in Afghanistan will be much more difficult and unlikely than the settlement was in Iraq -- but that even so, a robust effort against Islamist terror groups must continue regardless of the outcome of the war with the Taliban. Therefore, we expect that the United States will separate the two conflicts in response to these realities. This will mean that containing terrorists will not be dependent on defeating or holding out against the Taliban, holding Afghanistan's cities, or preserving the Karzai regime. We expect the United States to surge troops into Afghanistan, but in due course, the counterterrorist portion will diverge from the counter-Taliban portion. The counterterrorist portion will be maintained as an intense covert operation, while the overt operation will wind down over time. The Taliban ruling Afghanistan is not a threat to the United States, so long as intense counterterrorist operations continue there. The cost of failure in Afghanistan is simply too high and the connection to counterterrorist activities too tenuous for the two strategies to be linked. And since the counterterror war is already distinct from conventional operations in much of Afghanistan and Pakistan, our forecast is not really that radical. Confusion In Islamabad: Can Politicians & Military Handle The Mess? There are conflicting signals about what is happening inside the Zardari government, and mixed signals on U.S. and India. 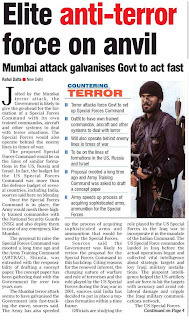 Pakistani experts are now convinced that India’s ‘evidence’ regarding Mumbai is not watertight. But a pro-U.S. core within the Pakistani government is preventing Islamabad from talking openly about it. The Pakistani media and political class remain confused about priorities, discussing nonissues such as the marks of a daughter of a senior judge and political backstabbing when the country faces a gathering storm on its international borders. 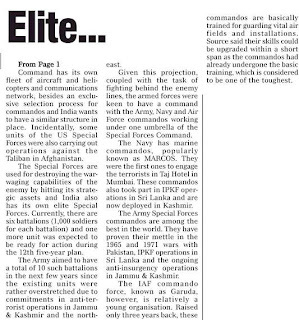 The debate within military circles is substantive. But the military won’t intervene. There are some indications that the Zardari government is taking a tougher line toward India and toward the proxy U.S. pressure regarding the Mumbai attacks and the U.S. attacks inside Pakistan. This change, if real, contrasts sharply with the initial passive attitude of the members of the government who appeared too eager to take in the sermons from U.S. officials and to appease India. The problem lies in the fact that this government is issuing contradictory statements. President Zardari, for example, has condemned, without naming President Obama, the Jan. 23 U.S. missile attacks inside Pakistan. But he is not ready to go beyond this or take a stronger public line. There are reports that his government has an understanding with Washington on increasing U.S. operations inside Pakistan. But Mr. Husain Haqqani, Mr. Zardari’s pointman and ambassador in Washington, was reported last week as having said that Pakistan might consider ‘other options’ if the U.S. did not change its policy. The statement raised eyebrows in Islamabad, coming from a known U.S. apologist in the elected Pakistani government. This hardline is tempered by other statements that verge on appeasement. On India, Prime Minister Gilani said on Jan. 14 that India’s ‘evidence’ on Mumbai attacks is more of ‘information’ and not evidence that can admitted in a court of law. But o Jan 23, Mr. Gilani told a London newspaper that Pakistan ‘needs to act fast’ on the Indian dossier and emphasized, rather sheepishly, that Pakistan is taking the dossier ‘seriously’. There are elements within the PPP government who are strongly pro-U.S. This includes President Zardari, Mr. Haqqani, and Interior Adviser Rehman Malik. The former national security adviser M. A. Durrani is no longer in this group. All four were either longtime residents in the United States and United Kingdom or retained strong business and personal interests in both countries. On the other hand, there are other PPP officials who do not approve of the policies of this pro-U.S. camp but are incapable of opposing them openly. This group supposedly includes – to varying degrees – Prime Minister Yousaf Reza Gilani and some other lower-level party officials. This division is fluid and is not immediately clear. One sign of it surfaced on Jan. 7, when national security adviser Mr. Durrani was caught making leaks to the Indian media to embarrass Pakistan. Mr. Tasnim Qureshi, the State Minister for Interior, appeared on television to confront the revelations that Mr. Durrani was making. A couple of news channels showed Mr. Qureshi quite disturbed by his own government’s national security adviser insisting that Ajmal Kassab, the name India uses to describe the man in its custody involved in the Mumbai attacks, was indeed a Pakistani citizen. Mr. Qureshi went as far as saying that Mr. Kassab was an Indian intelligence asset even if it was proven beyond doubt that he was a Pakistani citizen. President Zardari appears to be in a bind. He apparently has some commitments under the ‘deal’ brokered by the U.S. with former president Pervez Musharraf. But on the other hand, has to keep the Pakistani public opinion and the Pakistani military on his side. Pakistan Interior Advisor Rehman Malik has said that the rise in extremist activities in the tribal regions of the country was due to the help being offered to the extremists groups from some foreign countries. He said that foreign hands were patronizing terrorists in the Swat valley, and the Federally Administered Tribal Areas (FATA). Mr. Malik’s statement came during a closed door briefing at the Pakistan Foreign Office given to eighty diplomats based in the Pakistani capital, including U.S. ambassador Anne Patterson. Ms. Patterson was apparently keen to counter the impression that Washington is endorsing India’s position. This is an impression that U.S. ambassador in New Delhi and the outgoing Bush administration made quite clear. Additionally, the CIA, which is facilitating information exchange between ISI and the Indian security establishment, had also given clear indication that U.S. endorses the Indian ‘evidence’ without giving Pakistan the chance to verify it. Pakistani officials are now telling the Americans and the British that they need DNA samples from Mr. Kassab to ascertain that he is the same person whose name appears in Pakistani records. Pakistani officials are also talking now about asking India for access to three senior Indian army officers arrested for blowing up 60 Pakistani citizens visiting Indian aboard a train service known as ‘Samjhauta Express’ [friendship train] in 2006. Interestingly, the Zardari government has not made any formal request to India regarding access to the arrested Indian army officers. It could be possible that the government is releasing these trial balloons in order to show Pakistanis that the government is willing to take a hardline in defense of Pakistani interests. In this line of analysis, it would be fair to say that the Zardari government is reluctant to confront the ‘deal guarantors’ in Washington by taking a policy line that is confrontational in any way to the U.S. or its new regional ally, India. Chairman of the Senate Standing Committee on Interior, Talha Mahmood, said that the government was taking dictates from the foreign powers for promoting their agenda in Pakistan and had sidelined the parliament’s resolution that asked for a halt to the operations in the tribal and settled areas besides his committee’s recommendations. Talking to journalists here, Talha alleged that the government was being run by two or four persons who were taking dictates from the foreign powers instead of protecting the interests of the country and its people. “It is being trumpeted that there is a complete democracy in the country but it exists on papers only. Two or four persons are running the affairs of the government who don’t consider themselves responsible to the people or parliament,” he alleged. The former Deputy Chief of Staff of the Pakistan Air Force, retired Air Vice Marshal Shehzad Chaudhry, in an op-ed piece published on Jan. 21, called on the government to adopt an ‘institutional approach’ in analyzing the threats facing Pakistan. He called on the Pakistani military to temporarily shed its resolve not to interfere in politics and offer its institutional capabilities for crisis management to the government considering the exceptionally difficult regional situation. What gathers additionally on the horizon is even more disconcerting. What with the RAND study for the US Army engaging in a "long war"; and another sponsored by the US Joint Staff endeavoring to determine the most likely points of application of the US military in the future, pointing towards a nexus of Islamist threat in combination with a failed state of nuclear Pakistan that so scares the Americans. The importance of what RAND says or what the US Joint Staff is sweating on can never be underplayed. The RAND guys are no neo-cons working on extravagant notions of re-carving the world; instead they are at the delivery end working out the combatant level logistic, operational and strategic details. Pakistan has never been in a more critical security dilemma. Even the 1971 the loss of East Pakistan was not as dangerous in consequences as is the current and progressively deteriorating regional and global environment from Pakistan's perspective. 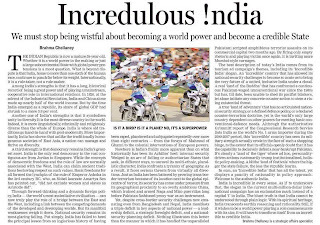 India is likely to continue to up the ante in terms of diplomatic pressure, enlivened by suitably spaced jingoistic support. It shall essentially be an effort to keep Pakistan embroiled in a meaningless banter and dissuade Pakistan from a steadied attention to the most important, hoping that Pakistan might implode from within under the weight of these compounding adversities. 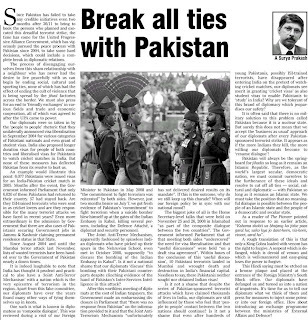 Another retired Pakistani military officer and a defense analyst, Ikram Sehgal, published an important article on Jan. 22, titled Cold-starting Pakistan, describing in detail an Indian military doctrine that is stunning in its aggressiveness leaves no doubts about India’s aggressive military intentions toward Pakistan. The article is important because it indirectly raises questions about how and why the U.S. government and the think tanks deliberately suppress such glaring evidence that shows India as a cause of regional instability and not the victim that New Delhi likes to portray itself as. Cold Start is the name that India has given to a policy of ordering rapid deployment forces to attack Pakistan in case of a terrorist attack inside or against India, without taking into consideration the other possibilities, like some third player trying to start a war, or the possibility of Hindu terrorist groups staging attacks and blaming them on Pakistan like they did in the ‘Samjhauta Express’ tragedy, according to India’s own investigations. Mr. Sehgal made two important revelations in his article. One on how a quick Pakistani military response dampened the chances of a possible Indian military aggression after the Mumbai attacks, and second, an important revelation about the distribution of Pakistani military forces in Pakistan’s northern and southern regions. 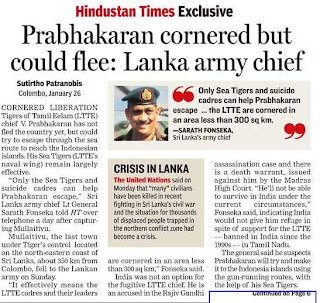 Rumors are afloat about a game plan where India will conduct surgical strikes against "known" terrorist camps, and Pakistan will helpfully turn the other cheek. Our rather helpless response to daily "Predator" attacks, bluster rather than any substance, has given weight to this belief. Bob Woodward's book "Bush at War" describes how, agonising over how to convince Pakistan, the US hierarchy was nonplussed by Pervez Musharraf's "ready and willing" acceptance of all seven US demands without even a murmur. Was diplomatic pressure recently brought on Pakistan to fall in line in the "supreme" interest of the "war against terrorism," the logic being that since only "terrorist" targets were to be engaged this was in "Pakistan's interest"? Wonder of wonders, for once we did not roll over and play dead! Our rulers probably calculated that the people of Pakistan would give them short shift. Initiating preliminary actions of their "Cold Start" Doctrine, the IAF was geared into a "first strike" mode. Picked up by our intelligence, the PAF responded by a "show of force" on "high alert." A dense fog then engulfed most areas of the likely military options. During this time-lag some strategic reserves were extricated from FATA and rushed eastwards, that "window of opportunity" for India passed. 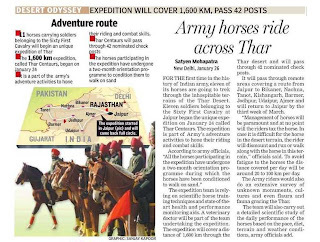 Mere coincidence that three Strike Corps are in "winter collective exercise" mode in the Rajasthan Desert? That too carrying their first- and second-line ammunition? Movement of their Amphibious Brigade and dumping of fuel for forward deployment of troop-lifting helicopters has also been detected. Pakistan's history is replete with strategic blunders of monumental stupidity, we have only been saved by tactical successes achieved by the great sacrifices and outstanding bravery of our soldiers, sailors and airmen, those who have actually taken part in action, and not just talked about it. Some morons thought up the "Defence of the East lies in the West," and we left East Pakistan defenceless […] Those who think that "the defence of the South lies in the North," i.e., putting the bulk of our Armed Forces protecting our main population centres and communication in the Punjab and AK, may be theoretically correct in a long-drawn-out war, in the short Indo-Pak version it is stupid, monumentally stupid, particularly in the face of the known Indian deployment. As night turns into day, the Indians will put their main effort in the deep South. 18 Div was almost overwhelmed in 1971. Two brigades of 33 Div were force-marched from the Rahimyarkhan area to stem the rot. Only the outstanding courage of individual unit commanders like Lt Col (later Brig) Mohammad Taj, S J & Bar (44 Punjab now 4 Sindh), saved Pakistan when "the barbarians were at the gate" in Chhor and Umerkot on Dec 12, 1971. Taj was symbolic of many brave officers who went up and down the line in the Thar Desert exhorting the rank and file, the line held. It was touch and go for a couple of days! Later, no one did more than Lt Gen Lehrasab Khan as Commander 5 Corps for improving our defences in the area but even his soldierly persistence did not succeed penetrating military obduracy to get the resources in men and material required for the Chhor-Badin-Sujawal area. Kayani must ensure that this time around we have enough in the Thar Desert and the adjacent coast. Our existence is a zero-sum situation; can we afford to take chances? These are issues that the political elite of the country is not aware of. In fact, with the lack of any organized research and analysis activities within the Pakistani political parties, it is no wonder that we see many Pakistani politicians and parties conducting their own private ‘foreign policies’ with outside powers. An A330 MRTT built for the Royal Australian Air Force completed another major program milestone when the A310 Boom demonstrator, used as test bed for the new EADS fly-by-wire boom, made a series of contacts during a flight test over waters off the coast of southwest Spain. Both aircraft departed from EADS facilities in Getafe, Madrid, where Airbus Military has the tanker conversion centre. The A330 MRTT is equipped with two wing-tip mounted ‘hose-and-drogue’ refuelling pods, an advanced aerial refuelling boom in the tail, as well as complete capabilities in Military Navigation, Military Identification, MIL-COMs including a Tactical Data Link and Defensive Countermeasures equipment. “This flight test represents a significant milestone in the program, as it is the first time that a contact between two different tankers developed on Airbus platforms has been performed” said Carlos Suarez, CEO of Airbus Military. During this phase of the flight test campaign the aerodynamic configura-tion of the pods has been proven and several hose-deployed tests have been conducted at different altitudes and airspeeds. In addition several contacts between the A310 Boom and the A330 MRTT Universal Aerial Refueling Receptacle Slipway Installation (UARRSI) system located on top of the A330 MRTT aircraft have been made, showing, as expected, the excellent flying qualities of the A330 as a receiver aircraft. Also, the mili-tary avionics system has been tested successfully.